I liked the late 60’s. Seemed that people were nicer then. Unfortunately I think that people aren’t as nice or polite now. Dude. I love this post. 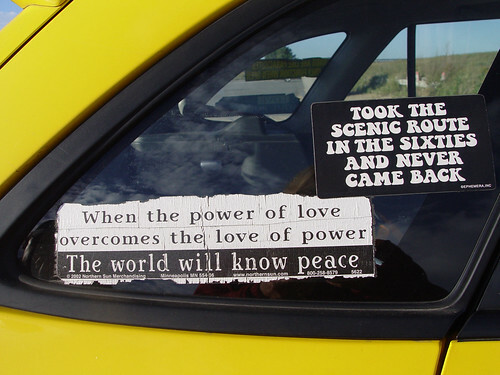 And I love the bumper sticker about world peace. Yes, age certainly has its advantages. If only we knew then what we know now . . .! Sometimes I think I haven’t learned as much as I hope I have learned. But at least my college student seems to be making better choices than I did at his age! I love that you have named it Brown Friday. Good sense of humor, you. I’ve missed you.